I wasn't sure about this book, not being a real fantasy fan, but it did have a mystery in it, and it was on sale. So I bought it, and am I glad I did! 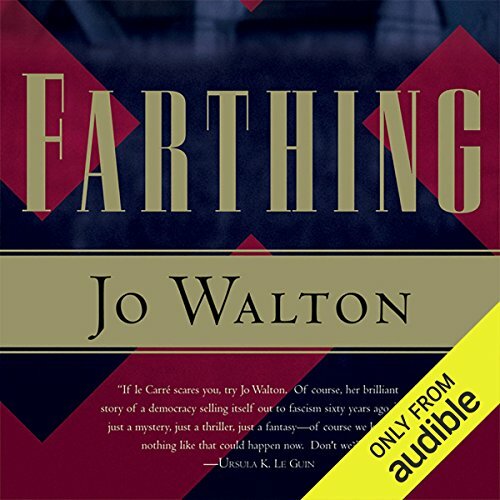 Jo Walton has crafted a mystery set in England in an alternate history, where a group called the "Farthing Set" deposed Churchill and negotiated a "peace with honor" with Hitler in 1941, in which Hitler stayed on the other side of the Channel and England remained "independent" by agreeing to measures which amount to a milder form of suppression of Jews and homosexuals than that in place in continental Europe. The action takes place in 1948, when a vote of no confidence is scheduled in Parliament. At a house party at Farthing, the estate of some members of the Farthing Set, the man who is likely to be elected the next Prime Minister is murdered. Lucy, the daughter of Farthing's owners, and her husband David Kahn, a Jew, have come to the party at the insistence of Lucy's mother. It's not clear why they are invited until it becomes obvious that they were wanted there in order to pin the murder on David, the JEW. The mystery story is quite good, but the real point of the book is the picture of an England which is sliding slowly and inexorably into Facsism through the machinations of the power elite (the Farthing Set) and the willingness of the public to believe the lies of the ruling politicians. Through the course of this book and the second book in this series, the suppression of Jews and homosexuals becomes more extreme, and many have been forced to flee or hide. And people in positions like police detectives are coerced into blaming the crimes of the powerful on the people with no power. Meanwhile, of course, Hitler is still Fuhrer of all of Europe, undesirables are still sent to work camps, and the war is still raging between Germany and Russia. The story is greatly enhanced by the two narrators, John Keating and Bianca Amato. The book is written in chapters which alternate between the narration of Lucy Kahn and the third party narration of the investigation conducted by Inspector Carmichael of Scotland Yard, making the alternating narrators particularly appropriate. Both do a sterling job. This is really a gripping tale, very complex and disquieting but definitely worth the money and the time to listen to it. Excellent! In Walton’s alternate history , 1949 sees the ruling Conservative Party dominated by the “Farthing Set”, a clique of high Tories credited with negotiating “Peace with Honour” between the Third Reich and the British Empire in response to Hess’ overture on behalf of Hitler in 1941. On the eve of an important vote in Commons, the Farthing Set is gathered at the house after which it is named, the country seat of Viscount Eversley, when Sir James Thirkie, chief negotiator of the peace, is murdered. From this premise Walton builds a story that uses the solidly-decent meme of an English Country House murder (à la Sayers or Christie) to expose the fascist underbelly of the British Empire, built on anti-Semitism, xenophobia, misogyny, homophobia and an entrenched class system that places the powerful above the law. Walton tells the story through the eyes of two protagonists, Lucy Eversley Kahn, daughter of Viscount Eversley and Inspector Peter Carmichael of Scotland Yard. These characters are inspired choices that humanize what might have turned into a political rant, give an insight into the choices made by “decent” people confronted with Fascism at home, and make the world that Walton has drawn, much more chilling by being much more credible. One cannot help but like Lucy. She is the acceptable face of the English aristocracy: a kind, intelligent, self-deprecating, independent woman, who loves her father and survived the disdain verging on hatred of her mother and who has sacrificed her privileged position in society to marry and English Jew. As the story unfolds and the true nature of the evil that is behind Thirkie’s death is understand, Lucy leads us from shock through revulsion and on to pragmatic action and a search for hope. In another world, our world perhaps, Inspector Carmichael, with his sharp mind and his need to find the truth would be righting wrongs and improving the capabilities of the Metropolitan Police. In this world, it quickly becomes clear that he is more vulnerable than powerful and that “doing the right thing” may not be a choice that is available to him. I admire Walton’s ability to show what Fascism really does to freedom by showing the damage it does to those who our laws and our democracy ought to make safe. I find her alternate history very credible. In my view, modern Britain was fundamentally shaped by the decision of the British people in the “Khaki Election” of 1945, the first election in ten years, held on the heels of Victory in Europe Day, to put their trust in Labour Party, rather than the Conservatives, to rebuild Britain. By imagining a Britain in which this choice was never made and where Fascism in Europe was colluded with rather than challenged and defeated, Walton reminds us that the freedoms we enjoy today were hard-won and could be easily lost. I listened to the audio version of this book. Bianca Amato, who reads the chapters written from Lucy’s point of view, does an excellent job. Her accent is perfect as is her finely nuanced use of emotion. John Keating reads the chapters written Peter Carmichael’s point of view. He does a fine job of the voices of most of the characters but I thought the voice he used for Peter was a little off. His accent was too working class for someone educated at a minor public school. Nevertheless he was easy to listen to and handled both emotion and factual exposition well. I recommend this book both as a good read, it is an excellent murder mystery, and as a reminder of the sources of power Fascism draws upon. Jo Walton's murder mystery set in an alternate history Post-WWII England is a little unsatisfying since there a couple of "loose threads" and true justice is at best postponed. I would also argue a bit with the alternative history. In this version of World War II, the US never enters the war and Britain negotiates a peace settlement with Hitler to avoid invasion by the Germans. The chances that the Japanese would not have pulled the US into the war with attacks on China and the Philippines even if they had not hit Pearl Harbor are slim. (There's a reason all that Navy might was amassed at Pearl Harbor in the first place!) And the isolationists in the US would not have been able to hold out against the military-industrial complex (hence the Lend/Lease Act) forever. Having read the whole trilogy, I felt like Jo Walton's view of a alternate history reflected a rather Euro-centric point of view throughout and she discounts countries with vast natural resources and large populations like China, the US, and Russia and doesn't even address the enormous change in the world economy that oil and natural gas created. World War II may have marked the end of colonialism and the shift in world power, but the war was only one element of that change. Leaving that aside, I think this book and the series truly does succeed as a cautionary tale and gives the listener much to ponder. The ineffable slide into Fascism that comes with great fear and ignorance in the citizenry at large can be seen everywhere - witness the Patriot act (the fear of terrorism negates the rights of the individual), or Russia having freed itself of communism, but still mired in regional/ethnic conflicts is now quickly sliding back into totalitarianism. Jo Walton's trilogy beautifully illustrates the poem, "First They Came" by Pastor Martin Niemöller. And whether or not you buy into this possible alternative to history, it is abundantly clear that a world where Hitler wasn't stopped would be ugly. Walton's prose is very nice and she uses setting extremely effectively to help drive the plot. The city of London, the surrounding countryside (and its denizens), as well as the very class-conscious society all play a part in the tale. In each of the 3 books in the series, Walton tells the story from a woman's POV in first person and a man's POV in third person. The woman changes in each of the books while Detective Carmichael is in all three. John Keating and Bianca Amato both do nice turns in narrating alternate chapters of this first book. Amato is much better here than I've heard her before - no breath sounds - and her voice is perfect for Lucy. I'm not sure Farthing would satisfy the true murder mystery aficionado, but if you enjoy the what-ifs of alternate history, or have an interest in WWII, you will probably find this book and the whole series worthwhile. You should know going in that this first book isn't really meant to stand alone. It has a rather disconsolate conclusion and the real story spans all 3 books in the trilogy. Too abrupt of an ending - very deflating. What disappointed you about Farthing? I thought the book was a murder mystery, and the plot develops toward that end. However, I saw the ending as more of a social commentary on political structure of the " alternative England." Would you ever listen to anything by Jo Walton again? Have you listened to any of John Keating and Bianca Amato ’s other performances before? How does this one compare? I have not but enjoyed their both of their performances. This is not a " who done it " book. If you could sum up Farthing in three words, what would they be? The author's imaginative wielding of the fictitious storyline with the edges of fact. The place that Britain nearly became. I've already listened to the second part of the trilogy - it is just as good and I am about to listen to the third one. What a shame it's only a trilogy. This was a very odd book. I enjoyed most of it, but it was very odd. It took a bit of mental calisthenics to adapt to a 1949 London in which "Old Adolph admired England and had no territorial ambitions across the channel". Because this world's Old Adolph most certainly had all sorts of ambitions across the channel; he was drooling to get into London and execute the entire royal family. Rather than that straight-forward and outright horror, the horror in this book is … sneakier. "In May of 1941, the war looked dark for Britain. We and our Empire stood alone, entirely without allies. The Luftwaffe and the RAF were fighting their deadly duel above our heads. Our allies France, Belgium, Holland, Poland, and Denmark had been utterly conquered. Our ventures to defy the Reich in Norway and Greece had come to nothing, The USSR was allied to the Reich, and the increasingly isolationist USA was sending us only grudging aid. We feared and prepared for invasion. In this dark time, the Fuhrer extended a tentative offer to us. Hess flew to Britain with a tentative offer of peace, each side to keep what they had. Churchill refused to consider it, but wiser heads prevailed…"
Wiser heads prevailed, and those damned isolationists in the US held sway, and Britain made a peace with Hitler, and now most if not all of Europe is under a blanket of fascism. Being Jewish is a very, very difficult thing, when it isn't outright life-threatening, wherever you are. And Orwell imagines his dystopia happening ten years earlier than in this world. (That is a lovely subtle touch.) And the United States is led by President Lindbergh – which … Heaven forbid. And it is in this universe that Lucy and her Jewish husband David return to her family's estate for a house party, during which there is a good old-fashioned country house murder. There were things I did not like; Lucy uses a verbal shorthand she had developed, but the reader is not clued into exactly what she's talking about until what seemed like a ridiculous ways in. (Page 96 – looked it up. So a third of the way through the book.) It's pretty clear through context what she means by "Athenian" and "Macedonian" and so on – but not totally clear, and a little baffling as to WHY she would be saying "Athenian" and "Macedonian" and so on. I never warmed up to most of the characters. Heaven knows Lucy's family didn't deserve warming up to…they are snobs of the first water. "How many servants do you get by with?" "Just three," David said. "A cook, a housemaid, and a kitchen maid. …"
- Goodness me. And here I thought that was something one was taught to do as a toddler. And Lucy – one of the two point of view characters – began to grate on me. She says, often, that she isn't too bright, though the plan she comes up with is not terrible … but her speech and behavior thoroughly agrees with the "not too bright". Is it all a front? Does she really think she's stupid (perhaps because her mother has taught her so) when she's not so dumb after all? Who knows? She is rather flighty, and certainly fanciful: to avoid spoilers, I'll just say that she develops an unshakeable certainty of something about which she couldn't possibly have a clue, and proceeds from that first moment of certainty as if what she believes is rock solid truth. Is it? Who knows? Speaking of servants … Things are a bit odd with them in the country house where the good old country house murder takes place. I mean … they're servants, when all's said and done, employees hired and paid to do specific jobs, in a class structure which requires them to show respect to their social "betters". But here the attitudes are extraordinary – and Mrs. Simons, the housekeeper, is outright offensive. Blatantly, intentionally, viciously rude. Lucy: "I didn't like how quickly I'd resorted to threatening to sack her" – WHY? My God, are you mad? Fire that nasty cow and eject her so hard and fast she bounces twice going down the drive. The book alternates viewpoints between Lucy, on the scene of the murder, and Inspector Carmichael, in charge of investigating said murder. And it's all rather repetitive – not even just because of dual points of view, which is handled fairly well. "He might have committed suicide." "Why would he kill himself?" then a little while later "He might have killed himself." "Why would he commit suicide?" This happens over and over. I gave this four stars to start with, but – after some time has passed, and having listened to the ensuing two books, and just looking at the notes I made while listening to this one – I bumped it down to three. Because on the whole I really, really hated this series – and, honestly, with the level of exasperation in what I wrote at the time I'm a little shocked that I did rate it higher. Where does Farthing rank among all the audiobooks you’ve listened to so far? Farthing was intriguing and complex. At times the plot was hard to follow, and there was a long list of characters to keep track of, but the characters were interesting and easy to sympathise with. I love British murder mysteries, and this one was very satisfying with the additional twist of taking place in an alternate reality. I did have trouble turning off the i-pod with this one - I listened to it all in three days! I can't wait to listen to the next two books in the series. What if Britain 'negotiated' peace with Hitler? In this novel; events take place several years after the war ends in Britain; but the battle still rages in Kursk and other regions. This novel is both a mystery and a social commentary. However the social commentary is much more matter of fact than preachy. The author delivers his/her message in a way that doesn't so much beat the reader about the head; but allows one to explore their own response to the message in and ponder how they would react in a similar situation. Definitely a worth-while read and I'll be reading the other two books in the series soon. The ending sneaks up on you and then one is left disappointed. Performance was good though. This book had a great premise, the alternate history was well thought out and the politics were believable without being too complicated to follow. The mystery aspect was interesting although not as mysterious as the author might like it to have been. I had two problems with the book. The first was how it was told part in first person and part in third person, it just didn't really work for me. More importantly, the book ended rather abruptly and left me really unfulfilled. I know that in real life everything doesn't wrap up all nice and tidy, but these are books. I took a peak at the review for the next book, and it doesn't seem to pick up on the same story. The ending was disappointing. Other than that it was great.